Welcome to the Spurwink House in Cape Elizabeth! Offering 3 bedrooms and 2 bathrooms located in the privacy of Ram Island Farm. Luxury oceanfront home located in Cape Elizabeth facing the ocean and Higgins Beach. Staircase leads down to the rocky shoreline. The home has been newly constructed in 2018. Two levels of living offer comfortable accommodations for up to 6. Strict occupancy rules apply. Main level offers an open concept kitchen, living room and dining room with expansive ocean views. 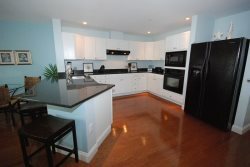 Heating and cooling system, custom kitchen, stainless steel appliances, Core Tech flooring, full first floor bathroom. Living room offers plenty of seating with water views. Dining offers seating for ten. Sun porch on the front of the house offers abundance of seating and ocean glimpses. Master Bedroom with a custom walk-in closet and full bathroom. Two access points to wrap around balcony, with outdoor seating, facing the ocean. Sliding door off dining area. A second living area equipped with a Smart TV and seating. Heating and A/C unit. Full bathroom off living space. Bedroom 1 offers queen bed with high quality linens, a closet system for comfortable storage and water views. Bedroom 2 offers two twin beds with high quality linens, a closet and an ocean view. Home is direct oceanfront owning some of Maine's most ideal coastline with private water access.